Doing it right- Lou Reed & Laurie Anderson. In my previous post, I shared my reflections on this crazy tapestry of life we each weave strand by strand through our actions and words. The garments we create take many forms and are as unique as we are. There is no “one size fits all” to living a worthy life. 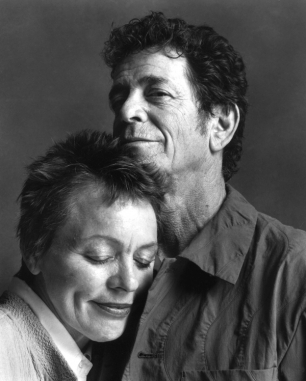 With the publication of Laurie Anderson’s moving, tender essay about the death of her husband and long-time best friend, Lou Reed, we have an incredible example of doing it right and doing it your own way. Lou’s life, and his life with Laurie, was by no means perfect- but it was true and filled with deep love, learning, and creativity. I hope you take a few minutes to read and enjoy Laurie’s essay, published in Rolling Stone.